Unless you follow my work closely, you probably weren’t aware that I used to develop apps for the Pebble Smartwatch. The signature feature of my apps was a utilization of the awesome Pebble Timeline feature, which provided a new level of interaction and behavior that suited my apps perfectly. However, since Pebble was acquired by Fitbit, the Timeline servers have now been switched off. There are community efforts to continue support, however I have instead decided to shut down my Pebble Apps permanently. I currently do not have the time required to provide users with the experience they deserve when using my apps. It is preferable for me to bow out of the community and let another developer fill any the gaps. This applies to all of the apps within the archived “Pebble App Store” owned by the “Zevive” developer. Way back in April 2015, the Pebble Time smartwatch had been announced and was shipping soon. 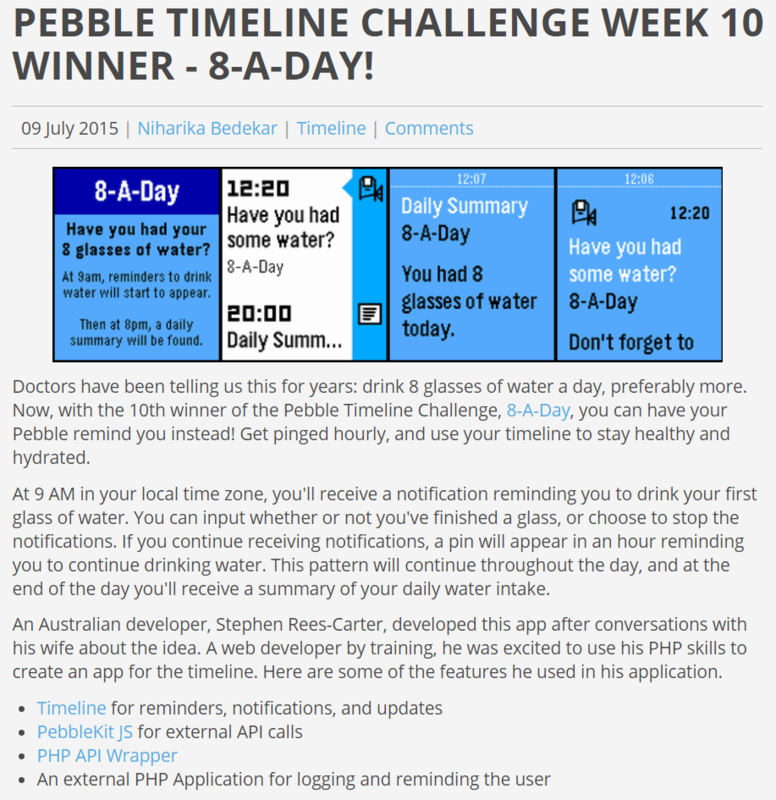 At this time, Pebble announced a competition to build apps for the Timeline feature. This was a way to encourage developers to use it and get apps in the store for customers. The Pebble Timeline was a web-API system for pushing events and reminders onto a customer’s Pebble. It was, in my opinion, absolutely brilliant! I took up the challenge and created 8-A-Day for the challenge! The 8-A-Day app was pretty trivial. It pushed hourly pins into your timeline, encouraged you to drink more water, and provided a summary at the end of your day on your progress. Needless to say, I was very excited! Part of the prize for winning the challenge was an invitation to the Pebble Developer Retreat 2015, in San Francisco. This was my first ever trip to the US, and I had a lot of fun and made a few friends. Before attending PDR2015, I built Timeline Tag!, a game where timeline pins are randomly hidden in your timeline for you to find. During the conference I built Poke!, a multi-player game where you poke your friends via the timeline and they can poke you back. I was also working on a new app called Habits, which expanded on 8-A-Day by tracking any sort of habits in your timeline. It launched a month after PDR2015 and was incredibly successful and popular. Following on from that, I built StepVerse, a step tracking watchface and app. It allowed you to compete against your friends by showing their progress directly on the screen with yours. Since then, these apps were all online and slowly accumulating users. You can find more details on my Projects page. Fast-forward to the end of 2016 and Pebble announced they had been acquired by Fitbit. Well, Fitbit acquired some of the Pebble developers and Pebble intellectual property. They had no interest in the Pebble products themselves, shelving and discontinuing production and device support for our beloved Pebble watches. The only silver-lining was that Fitbit agreed to keep the web services online until the community could take them over. This kept the servers online until July 2018. In July 2018, Fitbit switched off the legacy Pebble servers. There have been some community efforts to continue supporting the Pebble ecosystem, such as Rebble and RPWS. However all options require exclusive use and likely other changes if you want to use the Timeline API – which all of my apps do. Fitbit invited me into the early access beta for the Fitbit Ionic, due to my prior involvement in Pebble development. For this launch, I wrote a version of StepVerse for the Fitbit OS (current Ionic and Versa). I was quite proud of the results, however the limited nature of the Fitbit SDK and app store has resulted in disappointingly low sales. I also haven’t had any time to work on the app in a while. Similar to the my Pebble apps, I will need to make a decision regarding Fitbit StepVerse soon too. Pick one (or more) Timeline community efforts and build support into each apps. Option #1 is better for users and the various Timeline communities, however it also involves a significant investment in time. Time is, unfortunately, a very important commodity to me at the moment. To get around this, I could hack in support quickly, but the user experience would suffer. Ultimately, option #2 won out. It requires the least effort on my part and it doesn’t ruin the user experience. For me, that’s a win. I’d like to finish by thanking everyone who has used my apps over the years. I know there were some huge fans of Habits and 8-A-Day, and I sincerely hope you can find alternate apps that meet your needs.